From the essentials of fire safety to the need for TV subtitles so that guests can relax in their rooms, this guide offers a comprehensive list of considerations and solutions for accommodating people with hearing loss inclusively. This illustrated document (revised in October 2017) is available below as a free download. Whether there for business or pleasure, people with hearing loss should feel safe, welcomed, and able to access the full range of hotel facilities – like any other paying guest. We hope this easy-to-read guide demonstrates how this can be achieved. This is the first publication in our series of guides on making hotels more inclusive. This document provides an overview of the most common types of hoists that may be suitable for use in hotel rooms and aims to fill the current knowledge gap by providing guidance, meaning and practical application in the design, use and management of hoist systems. It is hoped that hoteliers will use this as guidance when endeavouring to meet their duties under the Equality Act and in doing so improve the quality of their service by providing truly inclusive guest accommodation. This illustrated document (published October 2017 and updated in 2018) is available below as a free download. 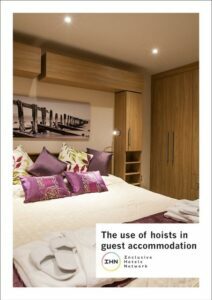 A hoist can provide the opportunity for a disabled person to stay away overnight – something that many people take for granted. This is the second publication in our series of guides on making hotels more inclusive.